Selected List of Planetary Gemstones and Talismans made available to patrons between Feb 21 to Feb 27, 2010 from the Gemstoneuniverse.com collection of fine, unheated, natural, Jyotish Quality Gemstones. Natural inclusion free Jewelery Grade calibrated Garnet from Mozambique. Total gem weight 2.70 carats set in sterling silver 925 Ladies ring. Shipped to Patron in Ontario, Canada. Final Price all inclusive USD ($) 102.50/ INR R.s4731/-. 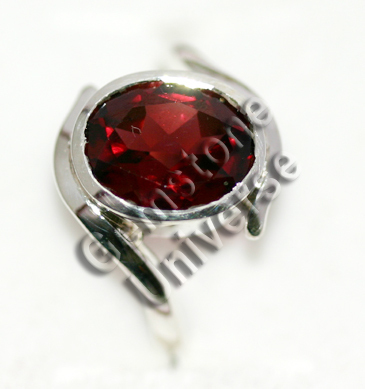 Red fiery Garnet gives excellent results as a Ruby alternative. Statistically we at Gemstoneuniverse.com are of the opinion that Red Fiery Garnet is much superior alternative uparatna of Ruby results wise as compared to other gemstones such as Red Tourmaline.